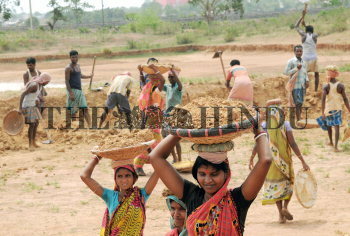 Caption : Kolkata: The resident of Kulpheni village near Salboni in Paschim Medinipur district of West Bengal are engaged into 100 days work which has been initiated under MGNREGS scheme. Most of the government initiatives of rural development are being hampered in the Maoist infested districts of West Bengal due to rapid violence. Photo: Arunangsu Roy Chowdhury May 25, 2010.